Racing tips: Yarmouth success for Kaanoon? 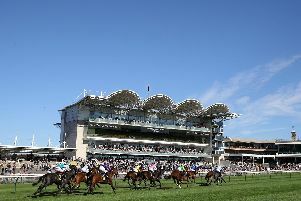 Kaanoon can continue his progression in the Moulton Nurseries Of Acle Handicap at Yarmouth. Roger Varian’s three-year-old is perfectly placed to take advantage of the weight-for-age scale at this time of year. His rating of 89 seems fair, he is taking on older, more exposed horses, and the likelihood is Kaanoon is still progressing. Mick Channon’s Rippling Waters began life in bumpers but, after two disappointing efforts, had her attentions switched to the Flat. She has already shown that she is well capable of winning a race on the level and after three respectable runs, she has earned a rating of 75. Mark Johnston’s Prairie Spy is giving lumps of weight away in the St Teresa’s Hospice Fillies’ Nursery Handicap at Catterick but she should still be up to it. A winner over six furlongs on debut at Thirsk, she then went to Bath over five-and-a-half furlongs and the drop in trip nearly caught her out. The ground was very fast there, though, and she was giving weight away to nearly all, so the fact she was off the bridle early is excusable. Andrew Balding’s Firelight made a pleasing debut at Sandown and this well-bred filly can take a big step forward in the 32Red/British Stallion Studs EBF Fillies’ Novice Stakes at Kempton. The best bet at Bath looks to be William Haggas’ Cosmic Love, who, having opened her account at the fifth time of asking, should be full of confidence for the Westonbirt Handicap. Bath: 6.10 Final Rock, 6.40 Dandilion, 7.10 Cosmic Love, 7.40 Gateway, 8.10 Defining Moment, 8.40 Mulsanne Chase, 9.10 Jaganory. Kempton: 5.20 El Principe, 5.55 Geranium, 6.25 Sicario, 6.55 Margie’s Choice, 7.25 Firelight, 7.55 Cliffs Of Dover, 8.25 Zzoro, 8.55 Blazed. Lingfield: 2.00 Telltale, 2.30 Dove Mountain, 3.00 Poetic Steps, 3.30 Street Jester, 4.00 North Korea, 4.35 Quiet Waters, 5.05 Rippling Waters. Catterick: 2.10 Associate Rock, 2.40 Makawee, 3.10 Prairie Spy, 3.40 Kirbec, 4.10 Stormin Tom, 4.45 Size Matters, 5.15 Perfect Thought. Yarmouth: 2.20 Sarvi, 2.50 Pink Iceburg, 3.20 Azam, 3.50 KAANOON (NAP), 4.20 Gratified, 4.55 Arendelle, 5.25 Shyjack.